What Is The Best Time To Trade Binary Options? If you’ve decided to get into binary trading, you’re going to want to make sure that you know what you’re doing before you plunge in. And part of that is coming up with a trading plan. That’s right, a plan, not just a trading system you read about. A plan incorporates other aspects of your trading than just your strategy, like what times of day and which days of the week you’re going to be the best to trade. Thanks to the way that binary options are traded, you can trade pretty much any time. You’re setting an order which will expire at some point in the future, which gives you a lot of flexibility. What are the best and worst times to trade binary options? During financial report releases and big news events. Whether this is a “best” or “worst” time to trade depends totally on you. If your strategy incorporates fundamental analysis, this may be when you place your trades. If you’re trading based on these events, you can make great money. If you don’t know what you’re doing and you trade during these times, however, you can lose a lot of money equally fast. Regardless of whether you trade during these times or not, be aware of them and decide on a consistent way to deal with them. Weekends and holidays. While some markets are open 24 hours, they aren’t open all week; even the Forex market shuts down over the weekend, and markets also take holidays. If you trade over a weekend or holiday you’re going to be faced with slippage and unpredictability when the market comes back into session. Great way to lose money! This is a bad time to trade. Middle of the week. This is a good time to trade, assuming of course there’s a rationale for placing a trade. Most unpredictability happens when you come back from a weekend or head into a weekend, so these days are usually a little less unpredictable. Times of day when nothing happens or any time when the market is behaving unusually. You’ll find out quickly that different financial instruments are more volatile at different times of day. If you’re a short-term trader, you won’t want to trade during times when there’s no real opportunity to make money. At the same time, though, you want to avoid whipsaws and choppiness. Hopefully following these suggestions will help you to avoid occasions where you’d be likely to lose money. Always test your method on real time data before you go live by opening a demo account with your broker! If you are a US based trader, we have a short list of binary options US citizens accepted to trade binary options. Ready to start trading? 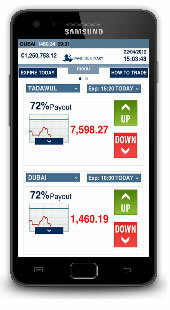 Visit 24Option.com and start trading binary options!